PINAUD (Pinolt, Pineau, Pinault), NICOLAS, merchant, commercial fisherman, seigneur, churchwarden, one of the directors of the Compagnie de la Colonie; b. c. 1665 in the parish of Saint-Michel, Carcassonne, son of Jean Pinaud and “honorable femme” Françoise Daret (Dazé); d. in August 1722. 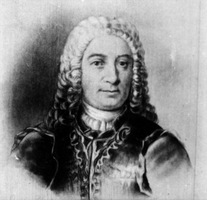 Pinaud’s career in New France paralleled that of his frequent associate, Charles Perthuis. They not only engaged in commercial endeavours together, but were married within a few years of each other, Pinaud in 1693 and Perthuis in 1697, and they died within six months of each other. Pinaud’s marriage contract, like that of Perthuis, was witnessed by the political and economic elite of the colony. His bride was Louise Douaire de Bondy, the widow of Pierre Allemand*, and the contract, signed on 9 Jan. 1693, describes Pinaud as about 28 years old and living in the home of Mathieu-François Martin de Lino. There is no trace of any children from his marriage but, in 1710, he and his wife made a donation to Marie-Élisabeth Waber whom they had rescued from the Abenakis in 1702. His widow, who long survived him, died some time before 1 April 1746. Pinaud’s commercial activities were many and varied. During the year of his marriage, 1693, he acted for Guillaume Maret of Bordeaux; the following year he equipped traders for the commerce of Hudson Bay. In 1696, he engaged in fishing, a business which he continued into the 18th century. That same year he traded in tobacco with Pierre Dubuc of Bayonne; Charles de Couagne was his business representative there. At the time of the formation of the Compagnie de la Colonie, Pinaud acquired 1,000 livres of shares. He was later a director of the company, and was named with Perthuis and René-Louis Chartier de Lotbinière, in 1708, to help recover the debts of the bankrupt enterprise. In the early part of the 18th century he acted as the representative in New France of Pierre Peire. Later, in 1712, he fulfilled the same role for Denis Riverin, the metropolitan agent of the Compagnie de la Colonie. After the death of François Hazeur, Pinaud also acted as a syndic in the settlement of the latter’s estate. Many times during his career in New France, Pinaud was called upon by the Conseil Supérieur to act as an arbitrator – to evaluate estates and merchandise in cases in dispute before the council. The council’s repeated use of him in this capacity reflects its trust in his judgement. When, in 1708, Intendant Jacques Raudot requested a gratuity to assist Perthuis and Pinaud in establishing a chamber of commerce, no immediate results were forthcoming. In 1717, however, such a chamber was established. In 1695 Pinaud rented a house on Rue Notre-Dame (sous le Fort); his widow was still living there at her death. He also acquired a property on Rue Porche, which he leased to the Compagnie de la Colonie in 1702; a common practice among shareholders and administrators of the company at that time. In 1714, he bought a house on Rue Saint-Paul in Montreal for speculative purposes; he sold it nine months later. In 1709, he acquired the seigneury of Île Percée, which had been seized from Charles Aubert de La Chesnaye. AJQ, Greffe de Louis Chambalon; Greffe de François Genaple. AN, Col., C11A, 3, f.468. AQ, NF, Coll. de pièces jud. et not., 1433. “Correspondance de Vaudreuil,” APQ Rapport, 1938–39, 1947–48. Jug. et délib. “Lettres et mémoires de F.-M.-F. Ruette d’Auteuil,” 1–114. Recensement de Québec, 1744 (APQ Rapport). P.-G. Roy, Inv. concessions, II, 128; IV, 183f. Charland, “Notre-Dame de Québec: le nécrologe de la crypte,” 178. Gagnon, “Noms propres au Canada français,” 154. Cameron Nish, “PINAUD, NICOLAS,” in Dictionary of Canadian Biography, vol. 2, University of Toronto/Université Laval, 2003–, accessed April 18, 2019, http://www.biographi.ca/en/bio/pinaud_nicolas_2E.html.